I’ve always been a bit apprehensive of cooking red meat. I like it a certain way, and because it can be rather expensive, I’d rather not give myself the chance to mess it up. Steaks, lamb and duck have been off-limits in my kitchen – until yesterday. I was given the opportunity by the people at EatWelshLamb to try my hand at preparing a dish of my choice. While they encouraged me to be creative using a whole load of ingredients they sent me, I preferred to keep it simple by trying one of the many many recipes on the East Welsh Lamb website. This easy recipe for a Moroccan-style tagine takes about an hour and a half to cook, with a good 20 minutes of prep time. I took a couple liberties with it by adding tomatoes and dried apricots to the mix, but you certainly don’t have to. The result was an absolutely gorgeous dish of very tender and rich slow-cooked lamb with savoury spices, a hint of sweetness and enough spice to tantalise your taste buds. I served mine over couscous. Place lean lamb cubes, onion, cumin, cinnamon, ginger, chick peas, stock, juice, tomatoes, apricots and zest into a large casserole dish. Cover and cook for 1-1½ hours until the meat is tender. Remove lid and sprinkle on the couscous, lemon and seasoning. Replace lid and return to oven for about 20 minutes until liquid has absorbed (add a little more stock if a little too dry). Serve the tagine sprinkled with mint. A few weeks ago, my friend Mihnea was in London from Bucharest for a day, so I suggested we get a lunch around my office. Having all but checked off every quick lunch spot on Charlotte Street, I set my eyes further afield: Cleveland Street – home to a few cute little places I haven’t tried yet, including La Menara a tiny Moroccan and Middle Eastern restaurant. Should have known though. When it came, there was cucumber in the salad. I apologised and asked if I could be made another one since I can’t have cucumber (Yes, I’ve become one of those people. Sorry, but it’s just easier to say you ‘can’t’ have something rather than, “my throat closes up and I dry heave at the thought of XYZ”). He seemed alright with that, and quickly returned to the kitchen. One minute later, my sandwich appeared miraculously without cucumbers. I knew that he’d just taken the salad off, and put a cuke-free one on in its place, but I didn’t say anything. Sure enough, I take a bite, and I could still taste the remnants of those evil bits of pungent green monsters. 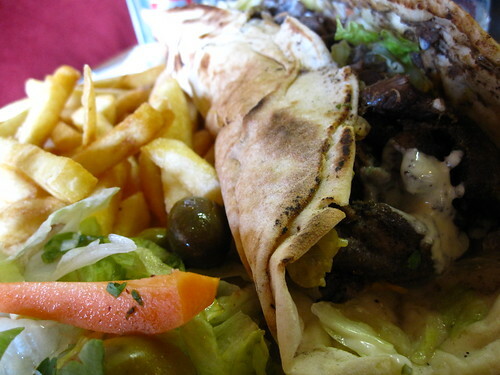 I tried to eat around it the best I could, but the pita was soggy, the lamb overdone and the garlic sauce very meh. The chips were way too salty, so I didn’t even really enjoy those either. ::le sigh:: Not such a fan of the food. All all. The owner was really really really nice though. I might go there again and try something else just because of him. I’ve never been to Balham before. It’s south and in Zone 3, so my only experience with it is either passing through on a train to the south coast from Victoria, or reading/crying about it in Atonement when Cecilia dies in the bombing and subsequent flooding of the station in WWII. But my friend Jordan and his lovely fiance, Emily, had their engagement party there since they live near-ish. Their party was at The Exhibit, which is a very large bar/restaurant. Knowing, however, that I would probably be starving at some point, and the restaurant at Exhibit didn’t look terribly exciting, I checked out the other goods, and stumbled across Tagine, a Moroccan restaurant not far away. Now, I’ve been on a bit of a Moroccan kick lately, namely in the form of Waitrose’s Moroccan chicken soup (it’s delicious, you really ought to try it), so it seemed only fitting that I should go and have the real thing. Leif and I arrived for a late dinner after the engagement party, I think about 10:30 or 11. I wasn’t sure if they would be snooty about serving us that late or even let us in, but the place was hopping. The sausages were absolutely delicious. 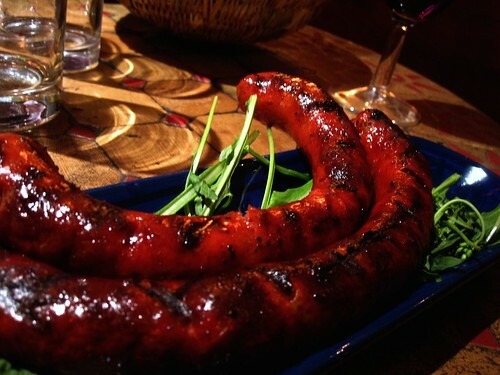 Very nice and crispy, almost chorizo-like in terms of robust flavour and spiciness. 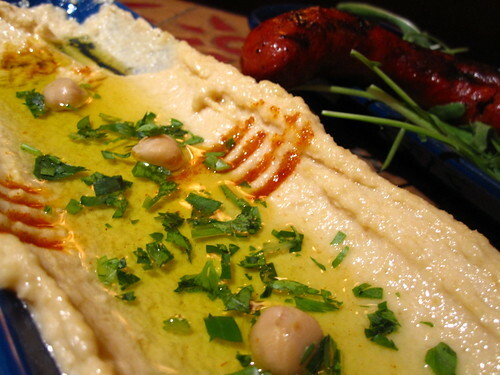 Houmous was equally as flawless with a very mild olive oil and nice chunks of whole chickpeas still in the puree. Even if it’s not, that always gives the impression of homemade. 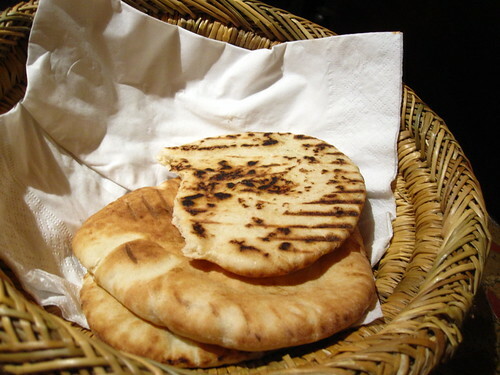 Pita bread was warm and slightly crispy as well. Gorgeous. 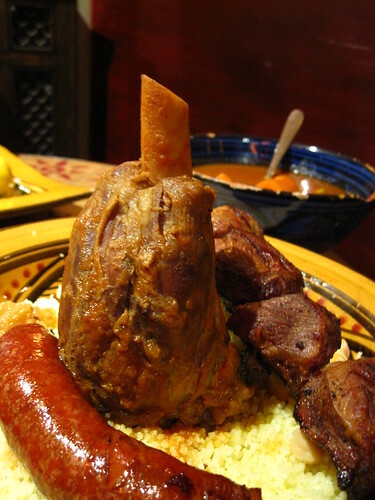 Couscous, lamb shank that effortlessly fell off the bone, lamb kebab and more sausages, served with chickpeas, raisins and a bouillon sauce on the side. I swear, I don’t think I even said anything for the first five minutes of eating this dish. It was truly the definition of om nom nom. It was huge though, so much so that I couldn’t finish it all. It didn’t go to waste though, I had a very hungry boy who happily snapped up the rest. I was gutted I couldn’t take another bite. This was a traditional whitefish served with a very mild sauce I can’t recall over Middle Eastern Couscous. 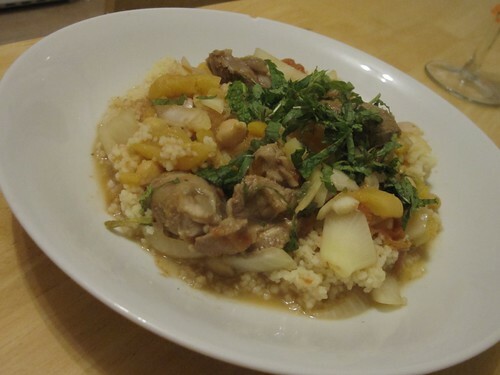 I sort of have this obsession with Middle Eastern Couscous. I haven’t really been able to find it here in raw form in any shops. Sainsbury’s has this side dish of it with chili oil, chickpeas and feta, but if I want an uncooked version to do with as I please, I have to bring it from America. Right now in my pantry, I have a giant stash from my last trip to a Whole Foods in Michigan. 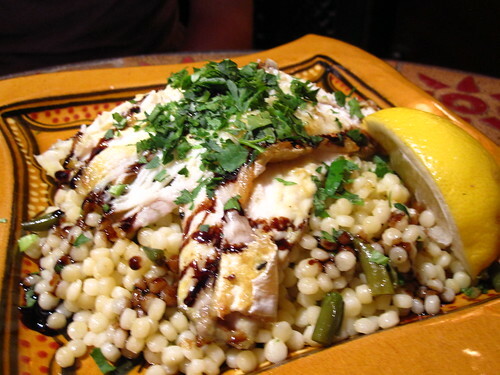 However, even with the yummy couscous, this dish though seemed bland in comparison to what I had. It was nice, but not anything to write home about. I only had a bite, but I’m ok with that – I really needed to concentrate on mine. So, basically we had one dish that wasn’t near perfection. Pretty good odds, if you ask me. The whole thing was pretty cheap too, considering – £38 for two, not including the wine we brought. Screw Zone 3, for this restaurant, I’d travel to Zone 6.